From Jeffrey Archer to Twinkle Khanna, all the best of authors of the world love it when they launch a book from the Crossword store in Aundh! Reason? Here you go..
A three storey building all dedicated to books and books and books! 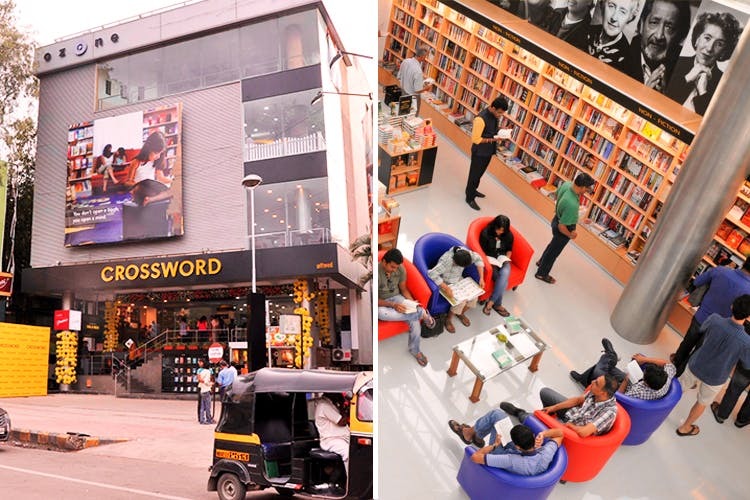 Crossword in Aundh hosts the country’s largest collection of books under one roof. A huge number of Indian and international authors, including Ruskin Bond to Durjoy Dutta and Shilpa Shetty Kundra, have visited Crossword Aundh to launch their books. What’s great is that all the launches are free to public. So the next time you’re at Crossword, don’t be surprised to see a celebrity writer launching their book. Make sure you get their autographs. Throughout the year there are various discounts and offers such as 1+1 or 2+1 on books or the current one of 70% off. From romance to mystery to non-fiction, there are various generes of books available at Crossword Aundh. Housing over 15,000 books, this place is a paradise for bibliophiles. Also if you are a stationery nerd, check out their collection in the first floor. Crossword Aundh has various places where you can sit and find out what happens next on your book and no one would disturb you!